Truly a beautiful collection of stories about ordinary people living ordinary lives until various circumstances come along and change everything. Sometimes they're changed for the better and sometimes they're changed for the worse, but either way these stories will leave the reader gasping . . . . Truly an amazing book by an amazing author with an amazing cast of characters. . . . This is honestly one of the best books that I've read so far this year! This book is the perfect balance of a fantastic writing style, character development, and human emotion. I highly recommend this book to all short story lovers or anyone who wants to read a book and truly feel satisfied with what you've read. This book will not disappoint! The stories in Mitchell Waldman’s PETTY OFFENSES AND CRIMES OF THE HEART startle a reader with sudden, uncompromising insight. They seem ordinary people engaged in ordinary lives until betrayals, accidents, and misfortune put the puzzles of their weak choices and unfair chance into stark relief when they are left with a kind of clarity they might have been happier not to have. Yet these stories are not moralistic judgments. Readers will come away from this book better for having spent time with Waldman’s well wrought characters, all sprung from the heart of an exacting writer gifted with compassion. Waldman gives the reader a full buffet of crimes and offenses; from large to small, physical to mental and subtle to spectacular. There's something to chew on and sink your teeth into. 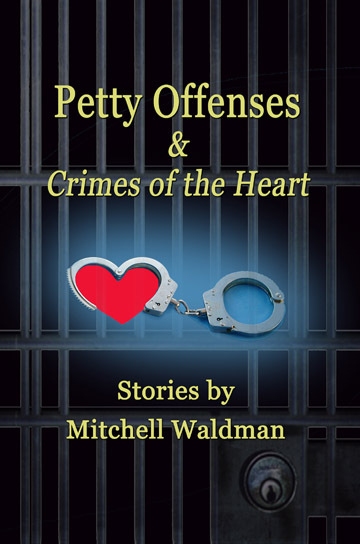 For those of you who enjoy olfactory metaphors, these beautifully crafted stories in Mitchell Waldman's collection “Petty Offences and Crimes of the Heart” can be described as “bitter sweet”. Each protagonist has a scar of some kind; an emotional wound which dictates their actions and the stories revolve around characters seeking to resolve these issues . . . . Some reach a level of greater wisdom and closure . . . . In other stories the characters do not enjoy the mixed blessings of “closure”, and some border on the macabre . . . . The lesson it seems from these stories is that you can use your life's experiences even when circumstances are beyond your control such as war or poverty and turn them around to move on and make choices or be a victim of your circumstances and allow them to control you. Either way there is a cause and a consequence of any action or choice . . . . Each of these stories can be read as self-contained compositions but I would recommend you read them in sequence to experience the themes to unfold as most satisfyingly do. We wrong ourselves as much as we wrong others. "Petty Offenses & Crimes of the Heart" is a collection of short fiction from Mitchell Waldman, who talks on many topics throughout recent history and the struggles to understand an impossible to understand world. With poignancy and wisdom peppered throughout, "Petty Offenses & Crimes of the Heart" is a read that is well worth considering, highly recommended.
. . . The stories [in "Petty Offenses and Crimes of the Heart"] leave the reader wondering who is the real criminal. . . .These characters have something to share -- something profound, something personal, and something that reveals a little about ourselves. Originally published by Wind Publications; republished in 2019 by Blue Lake Review. The crimes involved in the stories in PETTY OFFENSES AND CRIMES OF THE HEART may sometimes be petty – a man who leaves a bag of cat droppings on his neighbor’s doorstep after learning about his past – and sometimes involve criminal types (the career criminals in “My Life of Crime” and “Missing Pieces”). But more often the offenses involved are committed by and against ordinary people (the man in “The Nazi Next Door” who learns one evening, over a fence, that his neighbor’s father collaborated with the Nazis during World War II). And there are the mysterious offenders, such as the ambiguous interviewer in “Catching Up with Cartucci,” who unbeknownst to the interviewee, seems to have special knowledge and opinions about the latter. Some of the “crimes” in these stories run much deeper, are of a much more emotional nature. The offenders and victims in these tales have been much more tortured than by any run of the mill crime. Such as the mother in "Fortunate Son," whose son goes missing in action while on duty in Iraq, and the father in “The Duke of Broad Street” (nominated for a 2013 Pushcart Prize), who, twenty years after abandoning his daughter, shows up on her doorstep harboring a deep secret. Or the man in “A Ghost in Manhattan” who, during a lunch break, believes he sees his dead girlfriend in a crowd, walking the streets of Manhattan. Threads of danger and emotional trauma run through the fourteen stories in this collection. These are the dangers and traumas that we all risk in living our day to day to day lives, unaware of what may occur at any moment, or how our plans may be changed by the occurrence of one act, by one fateful moment. And in that moment our lives may be changed forever. Some of these stories have previously been published in such journals as Wind Magazine, Long Story Short, Shorelines Literary Magazine, Worldwide Hippies, eFiction Magazine, (Short) Fiction Collective, new aesthetic, Wilderness House Literary Review, and The Piker Press. Now available in Kindle and Nook e-book formats! LISTED AS A "NEW AND NOTEWORTHY" BOOK SELECTION BY NEWPAGES COM! Includes the Pushcart Prize nominated story, "The Duke of Broad Street"
In Mitchell Waldman's story collection Petty Offenses & Crimes of the Heart (Wind Publications, 2011) at the end of the story “Bad Neighborhood,” the narrator asks, “Is there any place safe to go?,” and after reading the book you will feel the same. Waldman’s stories present characters ranging from the descendants of Holocaust survivors to small time thieves to distraught lovers, and while there is pain in these stories, there is always the possibility of redemption....William Faulkner said that an author’s job is to make the extraordinary seem ordinary and to make the ordinary seem extraordinary, and in Petty Offenses & Crimes of the Heart this is what Waldman accomplishes. While reading the stories you may wonder “Is there any place safe to go?,” but you will be glad that you spent time in Waldman’s world. LIFT BRIDGE BOOKS, BROCKPORT NY! INTERVIEW -- "WRITERS ON WRITING"